When the World Health Assembly signed on to six Global Nutrition Targets in 2012, they were committing to saving millions of lives and allowing millions more to reach their full potential. But, like all things worth having, that goal won’t come easy. In our collaboration on the Investment Framework for Nutrition, R4D, the World Bank, and 1000 Days found that achieving the targets would cost $70 billion over 10 years, on top of 2015 investment levels. That’s an ambitious number, but the Investment Case also laid out a path to how donors, country governments, and others could come together to raise it. Last year, we published findings on 2015 donor aid aligned with the Framework. We’ve now completed analysis of 2016 disbursement data, which is the first year in which the Framework included a goal for new donor investment. And while the results aren’t without positive points, the overall findings are sobering. Not only are we missing our targets for increased donor investment in nutrition — we’re actually going in the wrong direction. The Investment Framework called for donor aid to increase by about $600 million between 2015 and 2016. With a 2015 total of $1.1 billion, that meant we needed to see a 2016 total of $1.7 billion. An early look at the data led us to predict that we might see only $150-250 million of that needed $600 million increase. But when we finished our in-depth review of 2016 disbursements, we were surprised to find that total donor aid had not only increased less than needed, but had actually decreased. After several more weeks ensuring we were interpreting the data correctly, we were confident that the decrease was real, though potentially small. What we hadn’t predicted was that health, food aid, agriculture and social services programs wouldn’t incorporate nutrition-specific activities as much as the previous year. This was the key driver of the decrease. A key strength of this work is that it’s based on much more in-depth review than the basic assumptions that drove our earlier estimate of a modest increase. 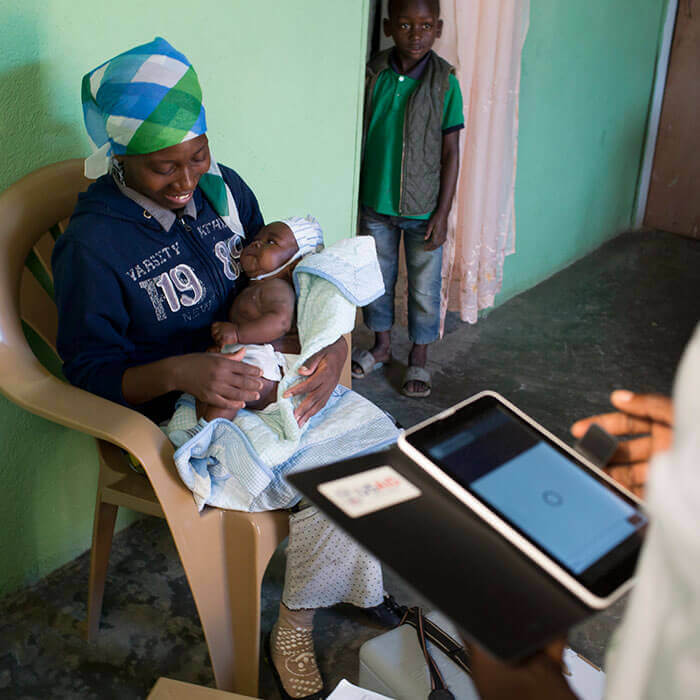 For the 2016 analysis, a team of researchers reviewed descriptions and program documents for 1700 individual transactions to determine whether and how they contribute to nutrition. And there’s no back-of-the-envelope substitute for the insight that gives us. 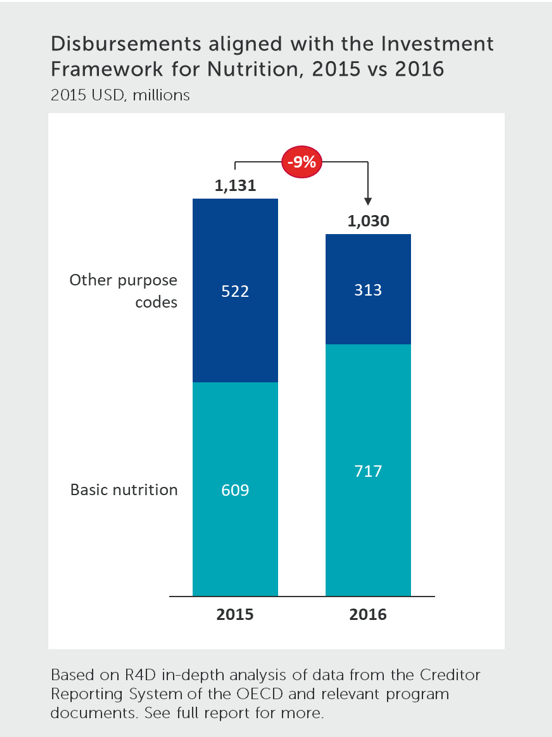 That in-depth analysis revealed that while nutrition spending from the basic nutrition purpose code increased between 2015 and 2016, Framework-aligned nutrition spending from all other purpose codes decreased substantially. The analysis does not reveal the cause of that change, but it’s clear that it’s a problem: while programs that focus exclusively on nutrition are crucial, the needs are too great to meet through nutrition programs alone. These findings should come as a call to action to donors and advocates alike. The Investment Framework is clear: achieving the WHA nutrition targets will require dramatic increases in funding from donors and countries alike. But these findings show that, on the donor side, Framework-aligned aid is decreasing instead. And that’s not just about some number on a page. While financing isn’t a proxy for impact, the WHA targets will not be met without the necessary increase in financing for the highest impact interventions — and, in fact, the latest Global Nutrition Report notes that the world is off course for 4 out of 5 targets in the Investment Framework for which there is data: stunting, wasting, anemia, and childhood overweight are all off course. (There has been some progress on exclusive breastfeeding, and data for low birthweight isn’t available). Unless countries and donors dramatically increase funding now, these targets will not be achieved. These findings should lend special urgency to the Nutrition for Growth Summit in 2020. It is an opportunity to come together and renew commitments to the WHA targets, to the proven interventions that support them, and ultimately to the children, women, and families around the world who were promised better. National governments, donor agencies, and civil society all have key roles to play. Given the concerning trend in donor aid revealed in this analysis, we call on donors to act now, and advocates to remind them of the importance of doing so: every year of delay means lives sacrificed and a steeper climb to achieve the WHA targets.